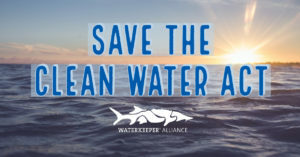 Home>Save the Clean Water Act – Comment by April 15th! The Trump administration is implementing its treacherous strategy to eliminate Clean Water Act protections for waters—and communities—across the country through a rulemaking that removes historically protected rivers, streams, lakes, wetlands, and other waters from its “Waters of the United States” definition. This rulemaking by the United States Environmental Protection Agency and Army Corps of Engineers is the most far-reaching attack we have ever seen on the Clean Water Act. By drastically reducing the waters protected by the Clean Water Act, it will cause untold damage to people, wildlife, and the country as a whole. Please join us in fighting for the heart of the Clean Water Act. Click here to file a comment opposing this rule. Simply provide your return address on the form and it will auto-fill with a comment that will be sent to the US EPA and the Army Corps of Engineers.